dang, it’s been a minute! are you guys ready for some tacos or what!? as you know from a couple posts ago I have been putting that fast + easy romesco sauce on pretty much everything. and guess what? 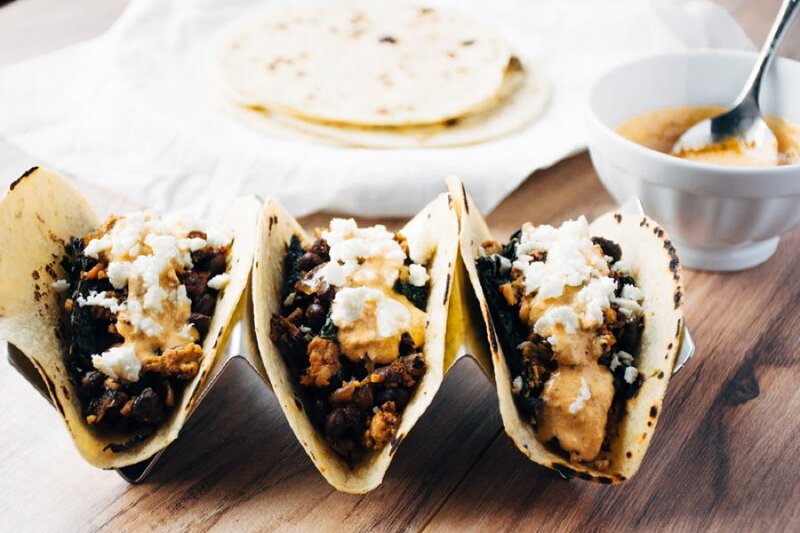 it’s a super bomb addition to these healthy chicken black bean and kale tacos, too! in fact, it even gets thrown into the recipe twice. that’s right, count it: TWO TIMES! but besides making cheesy choices I think you could really go with any chicken sausage that sounds good to you. keep it within the realm of taco-ish flavors and you’ll be good to go. and also keep in mind you will add some taco spices in addition to whatever herbs + spices have already been added to the chicken sausage for extra yum factor. I almost forgot the most important thing though: it must be a raw chicken sausage! you’ll cut that casing right off and put the meat + some yummy spices in the pan to brown up and get to know those melty onions and garlic that have already been cooking away. If it’s not raw chicken sausage, everything won’t come together in quite the same way. after the chicken is cooked through you’re going to add the drained and rinsed black beans, chopped kale, a little salt + pepper and cover that pan up so the kale has a chance to wilt. once the kale is pretty much cooked to your liking, dollop a couple spoons of that tasty romesco sauce in with everything, along with a big big squeeze of lime to lift up allll those deep + delicious flavors that have been developing and VOILA! healthy chicken taco perfection.  if you want extra points here: toast your tortillas in a hot cast iron skillet on both sides before loading it up! 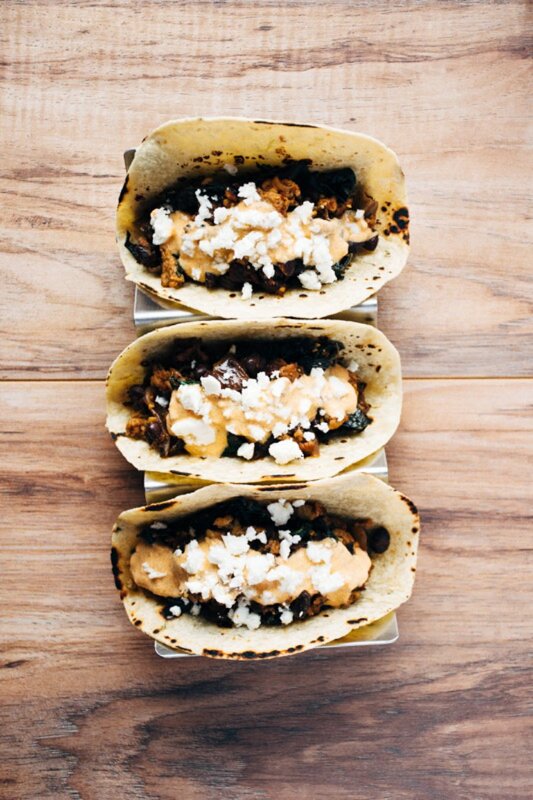 I know I missed the tuesday mark but let’s be real, tacos on any day equal a winning situation! 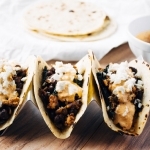 a quick and healthy recipe for chicken tacos with black beans, kale, romesco yogurt sauce and feta cheese. sauté diced onion with 1 tbs of your fat of choice and a pinch of salt over medium heat until soft and starting to caramelize. add chopped garlic and cook for one minute more, until fragrant. make a space in the middle of the pan and add chicken sausage, with the casing removed. press flat in the pan and cook, allowing to start to brown before stirring it around too much. add paprika and taco seasoning or chili powder and break up the chicken sausage into smaller bits. cook until meat is well browned and cooked through. add beans and kale to the skillet and toss to combine. cover and let cook for about 5 minutes, or until kale is wilted. stir in 2 big tbs romesco sauce and finish with a big squeeze lime + salt and pepper to taste. 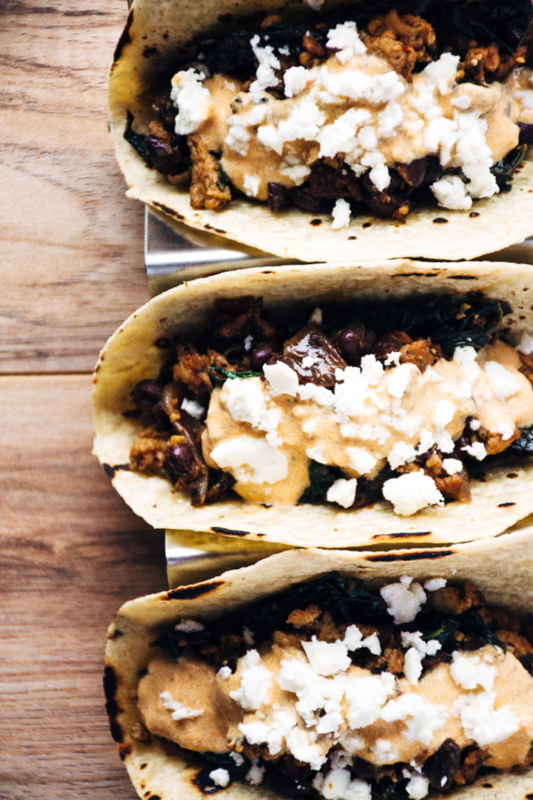 serve tacos topped with romesco yogurt sauce + feta cheese if desired! 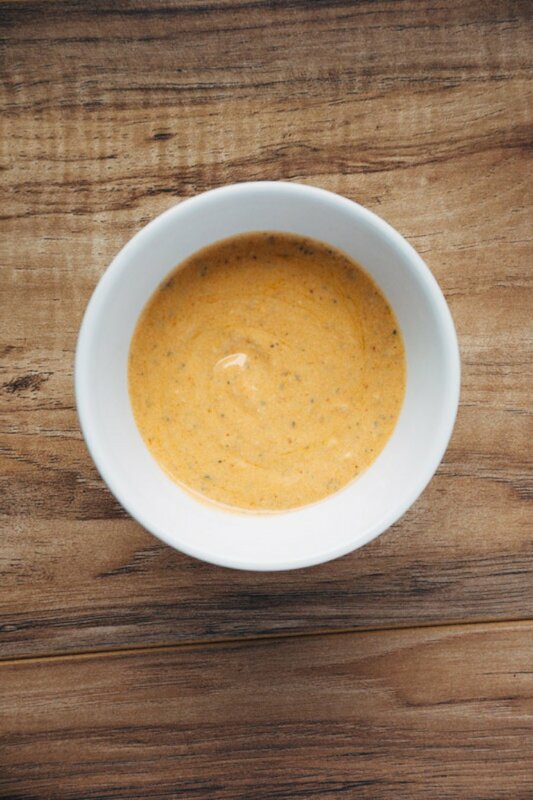 mix together yogurt and 1 1/2 tbs romesco sauce, and season with a pinch of salt. 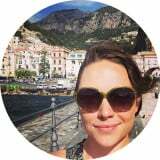 This entry was posted in dinner and tagged black beans, chicken, easy, easy dinner, gluten free, healthy, kale on March 31, 2016 by Nyssa Tanner.